So after the introduction, comes the pitch. Today, I’m going to lay out what we have planned to do with this universe. This isn't something we're trying to make money off of but rather establish an online outlet of creativity which everyone can try to be a part of. That's not only a goal we have for Supara but for SF Media as well. First off, Supara will have a dedicated website in every essence of the word. With that we're aiming to release our first issue (maybe the entire book) available online for free since we do not have the funds to cover any copyrights for the characters (roughly $30 each) or title of the book itself ($200). That's just to protect our work once it's in a physical medium. I'm not even including how much it would cost to put it in print and since we'd like to give out the absolute best quality possible; we definitely can't afford for it to be in hardback. So in essence… it's basically too much money to spend at this given time. Now Copyright Law does acknowledge that anything written or drawn (creatively/unique) on a website is considered copyrighted or protected virtue of the fact that we already own/host the site ourselves. In the end… that alone is good enough reason to go ahead and tell our stories. 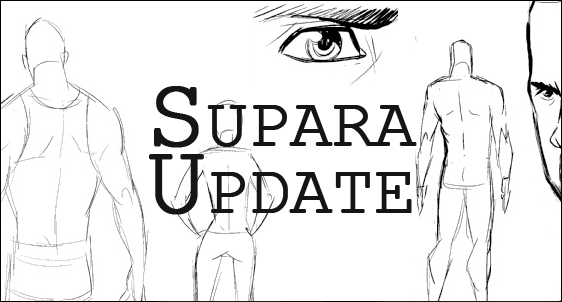 Back to the point... the site will also feature the continuation of this “Supara Update” column along with any other news, full character biographies with accompanying art galleries, fan & conceptual artwork, and a forum for a community. It doesn't end there because we don't want just tell a story in any single medium. We'll post up short and long form stories, develop and record audio plays , draw single web-comic panels, and create journal (blog) entries told from a few select character's point of view. All available for free... for you. This will allow us to keep pumping content in and around the development of our actual comics. Once all of this is finally in full swing, we're going to start up a Kickstarter page using this site and some of it's content as the profile. The Kickstarter will (hopefully) allow us to make back some of the money we put into this site and maybe get some exclusive prints made up for convention purposes to continually build word of mouth. As stated before in the introduction; we want to make an origin mini-series, and then split each character off into their own mini-series. No telling how long this process will take and your guess is probably as good as mine for how many comics are going to be within each series. But once that's a wrap, once each character has their story told... the chapter of “Supara: Season 1” will be complete. On the cover of each issue, they'll be a small but noticeable indicator explaining that this comic (issue) happens after the events of “S1”. Then we'll begin working on “Supara: Book 2” (also a working title) continuing the same premise as before except this time, each issue will have an indicator of “S2” explaining of course... that is it part of “Supara: Season 2”. We do this because the amount of content that we'll be producing isn't that grand so anyone could easily begin reading the entire saga without much or any confusion. Well... wasn't that a lot? I know. TOO much. But we're passionate and even if it's years in the making (we aren't delusional... they're years here yo). Though I can personally dig that idea. Look for a future Supara Update titled “The Pitch II” where we'll be separating everything into different phases because looking at this post. Big mess. If you have any ideas or suggestions about the absurd radicalness of our future... please comment below or e-mail the site. Later. Lost? Do you know what Supara is? Catch up by reading previous entries.